BlingLights BL660 LED Flush Mount Signalers lights inspired directly from Japan is the new rave. Just attach to side of vehicle and they blink along with your factory turn signals using your factory indicator controls. The long-life LED bulbs produces a unique eye catching accent with JDM style. BlingLights BL660 LED Flush Mount Signalers are sold as a set of 2. Available in your choice of Red, White or Blue with clear lens and chrome trim. Function: The absolute hottest flush mounts out on the market today. LED (light emitting diodes) lights are the wave of the future. These lights are made out of the highest quality materials that are designed to withstand the elements. They have a clear lens and when lit, 3 separate ultra-bright LEDs light up in which ever color you choose. The outer ring comes in chrome. Hooking them up: These lights have a very strong dual tape that attach to any flat surface. These lights have two wires so they are either blinking or running lights only. Housing is made of super heavy duty polyurethane which make them completely weather-proof. Kit includes complete installation instructions for install which takes about 10 minutes for each side. What is the BlingLights No Fault Guarantee? BlingLights will repair, or at our option, replace this product for up to 5 years from time of purchase. The NO FAULT provision of this warranty means that regardless of how the item may have been damaged or rendered unusable (fully or partially) by the Owner of the item, BlingLights will repair or replace the item without any questions being asked. To take advantage of this provision, enclose a money order for $15.00 (U.S. dollars) with the item to cover inspection, handling, and shipping. What is the advantage of LED output? LED output can match any color temperature perfectly, runs on less power, and LEDs never burn out. 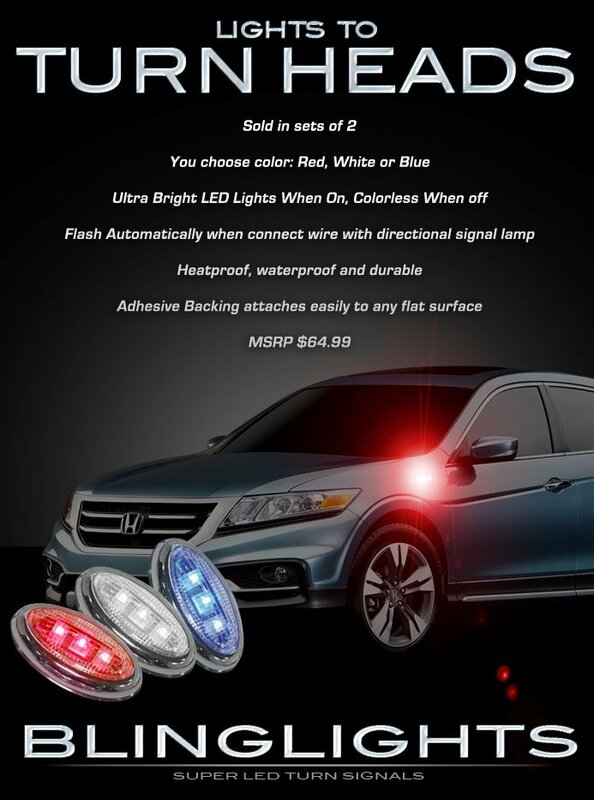 Lights are available in your choice of Red, White or Blue output to match your factory turn signals for a clean appearance. Once the order has been placed an invoice will be emailed to you with different payment options including credit or debit card directly over the computer or phone. If there is any problems making payment contact us so we can help. What is the return policy? You are entitled to a full refund less shipping costs if item is mailed back within 60 days of receiving item. Item must be in the EXACT brand new condition it was received along with the order number and reason for return. Keep the hat just for trying our product even if you decide to return. Please provide us opportunity to resolve any issues before deciding to return. Accepted payment methods; credit or debit cards, google wallet, paypal, bank or cashier's check and money orders. No personal checks. All payments must be made in US dollar currency.